A few months ago, I discovered Pinterest. It was love at first pin, but I knew I needed to be very careful and limit my pinning time to just an hour or two a week, otherwise, I'd lose entire days clicking and pinning all sorts of tasty recipes, clever tips and crafty creations. My 2-hour-a-week limit worked well for about 2 months. After that, it became to difficult to resist! So, I figured if Pinterest was going to cut into my Facebook time keep me from my housework, I should start creating some of the things I've pinned to my boards. I've been away from crafting for a few years, so I'm starting with smaller projects. Also, since we're pretty short on cash, I'm trying to find projects for supplies I already have on hand. I have loads of ribbon down staris in my craft bins. I went crazy buying yards and yards of ribbon a few years ago on ebay. I've used some of it over the years, but there's still a bunch of great ribbons in my stash! 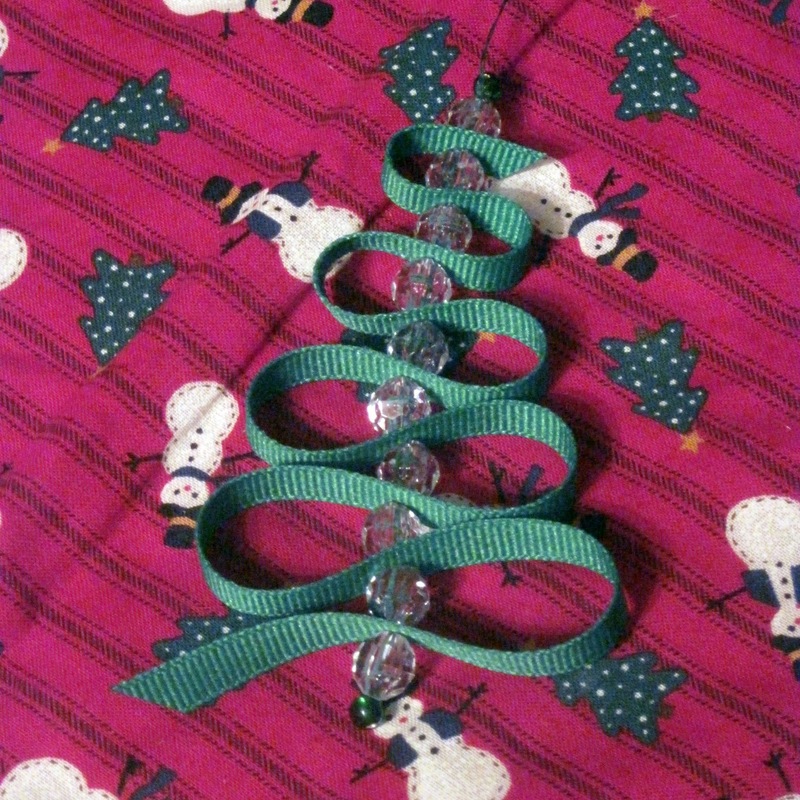 While browsing on Pinterest, I came across a sweet Christmas tree ornament made of ribbons and pearls. I knew right away I had to give them a try! I checked my stash and found green ribbon and some clear plastic beads leftover over from another ornament craft from several years ago (long before my blogging days). I'm so glad I didn't throw those beads away! Sometimes it pays off to be a pack-rat! 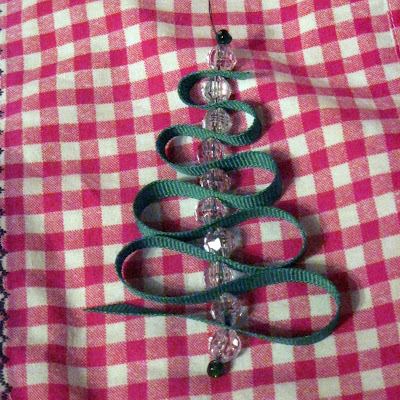 I followed all of the directions included in the tutorial provided by Annette over at Sunshine Yellow, except I skipped using the Fray Check, since I don't have it and didn't want to run out to the craft store. So far, I haven't had any problems with fraying. 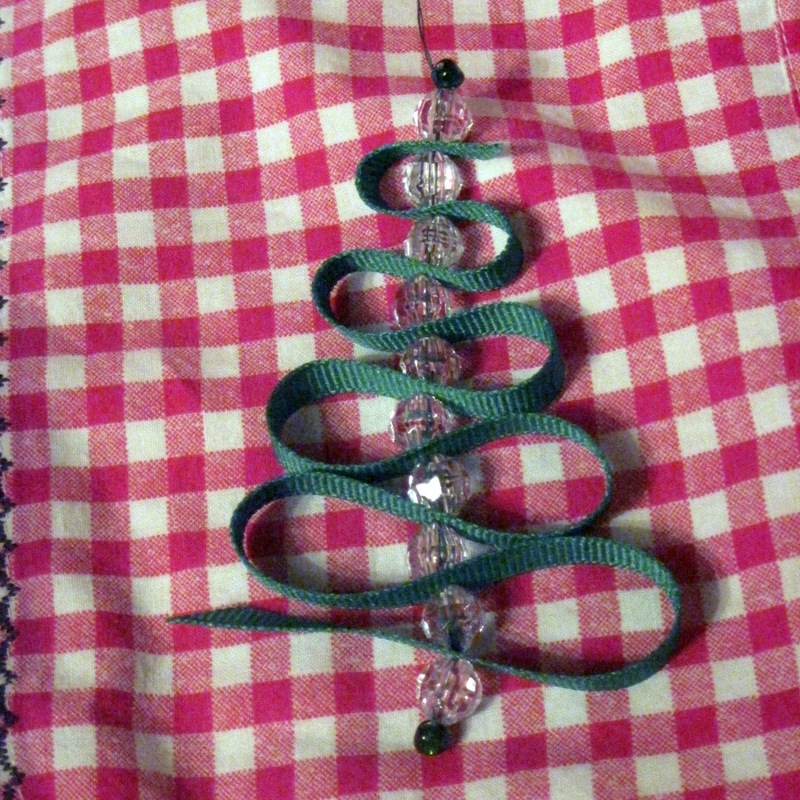 I think I might have enough beads in my craft box to make a few more of these cute little trees!